The itinerant exhibition which the Canton devised for foreign countries can now be seen in Berlin. 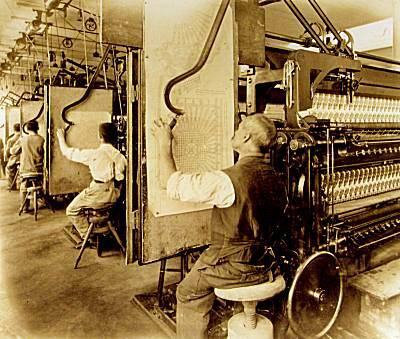 Schiffli embroidery machines, ca. 1910. The embroiderer guides the pantograph with his left hand following the rhythm of the machine. Instead of the threader, the inspector now checks that needles and threads are working properly. A second helper fills the Schifflis.